Atelier Ciseaux records was kind enough to send me the files of this Lucky Dragons 7" after I mentioned it a couple weeks back, and I've been letting it sink in over the weekend. I realized I must have not heard much of them before, or the context has changed because immediately Ducktails comes to mind, it has that atmospheric lounge almost sampled delay pedal feel. The A-Side 'The honeycomb house pt 1,2,3" starts out with maybe a mandolin, or probably a ukulele and acoustic with just a hint of animal collective-type indecipherable vocalizations, but it's definitely feeling tropical. The melodies work themselves throughout the three pieces, and when it comes back in the third part I realize I really missed it. It's that kind of long piece meant to be heard together like this where melodic phrases fade in and out of consciousness. They have an overall master plan that's unfolding. The rhythms subtly change, never leaning too hyptnotic...there's too much going on to be lulled asleep. It's no surprise they are from LA really, it's exactly what I think of...I think what is a surprise on the other hand is that same Ducktails sound is coming out of NJ? That makes no sense. This EP is the perfect sound coming out of that west coast climate. I can hear the palm trees...everything is a slow motion dream, with the windows down, driving from desert to desert. I'm even going further and saying it goes way out pacific to Hawaii (where they issue a lot of fake birth certificates apparently). The beach, with a bonfire, life is pretty easy. They've never made it sound so good. The B-Side is 6 tracks, a few of them no more than 30 seconds, these are definitely separate thoughts, coming from completely different places. I thought they were individual elements from the A-Side suite deconstructed, picked apart into something new, pushing the sounds...but that would be too easy and obvious. This whole single is clean sounding, there's no muddiness. There's more electronics in these fragments but it's not out of place. If these flute sounds are synth then they have me fooled. I imagine they work live instruments into the delicate samples. It's really optomistic sounding...it's weird because there's a hint of Pocahaunted in places but it never gets ominous. Available direct from Atelier Ciseaux or locally from fusetron. The seriously screenprinted jacket and airmail jack this up a bit in price, but there is a lot going on in these 12 minutes, it's the perfect accompaniment to Ducktails, and I'm glad to have found another group working in this experimental sampled tropical way. Title: Vrais Noms/True Names Format: 7" Label: Atelier Ciseaux Country: France Price: $11.00 "Its still a bit too early in this big empty house. In the yard, an unsound choir seems to grin childishly and fishily to the neighbours around. Sarah Anderson and Luke Fischbeck, LUCKY DRAGONS, live in Los Angeles and have been recording for about 10 years albums (on Marriage Records, Upset the rhythm…) which are as extactic as well as precisous. Their new ep Vrais noms/ True names (limited to 350 copies + free mp3s) is available now on Atelier ciseaux records (Paris/ France). 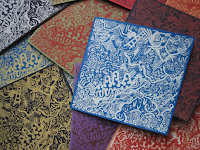 9 tracks for less than 12 minutes, with an artwork by SUMI INK CLUB and screenprinted covers on recycled paper." - Atelier Ciseaux.